NJSBA represents the interests of local boards of education wherever key decisions are made—in the state Legislature, in Congress, in the courts, and in the court of public opinion. NJSBA impacts education proposals in Trenton. Learn about recent developments in the Legislature and state Board of Education. Decisions in Washington affect federal program funding, accountability and assessment in our schools. 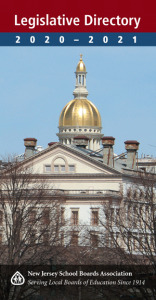 Access NJSBA’s Advocacy Agenda and sample resolutions and connect with lawmakers in Trenton and Washington.